Rules for Getting It Right - Now, and No Matter What! Over 50 percent of all business decisions fail; 82 percent of businesses go under before their 10th anniversary and 8 out of 10 new products fail. In direct contrast, research also shows that 91 percent of all businesspeople are as confident as ever in making decisions. Decision confidence is up. Success is down. While we are an inventive, entrepreneurial society, an innovation explosion has also been marked by business implosion. 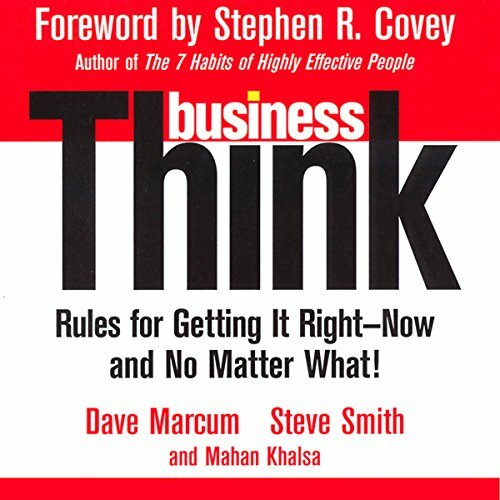 With rules like "Check Your Ego at the Door", "Move Off the Solution", "Create Curiosity", and "Get Evidence", businessThink goes where other business books are afraid to go and promises to significantly increase results by delivering hard-core business thinking and fusing it with high intuition and emotional intelligence to get it right - no matter what!